Despite the ongoing global economic crisis, or perhaps partly because of it, global emissions jumped a massive 5.9 percent in 2010. This is the largest jump ever recorded, according to a study by the Global Carbon Project, a global collaboration of scientists tracking global emissions. There was a short decline in emissions in 2008 and 2009 during the global financial crisis (GFC), with economic recessions in many countries. It seems that carbon emissions have well and truly jumped back. 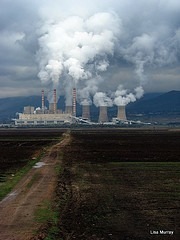 The Global Carbon Project has pointed out that the 2010 increase of 500,000 million tons of C02 is likely the biggest one year jump since the industrial revolution began. Emissions from China climbed 10.4 percent to 2.2 billion tons, which was the world’s largest amount of C02 emitted from one nation, surpassing the United States. Emissions from the U.S. climbed by 4 percent, after dropping 7 percent in 2009. The Global Carbon Project does not expect the unusually high annual growth in emissions to continue in coming years. However, given the so far insufficient actions taken by most countries to curb emissions, annual rises are expected to be around 3 percent for the foreseeable future, unless substantial action is taken. The study advised that urgent global emissions reductions of 3 to 5 percent a year leading to zero emissions over time, could work to avoid the all important 2 degree Celsius temperature rise that the world has agreed must not be crossed. The longer we wait, the more drastic the cuts are going to have to be, and there will be a point where they can’t be made fast enough. At the moment we are still sleepwalking into the future.